If today was the last day of your life, what would you do? Who would you cling to? What would be important? What would not be important? Sometimes when you put things into proper perspective, all those “issues” and feeling like you need to prove your point, your rightness, yourself… they no longer matter. Drop your boxing gloves, your swords, take all the blame (even if it’s not yours) and turn the other cheek. Is it really worth risking losing every part of it, losing the friendship, losing the relationship, losing the happiness of it. Sometimes the things you have even crying over or complaining about are not as big of deals as your heart has been breaking over and your mind has been telling you. Your life is not over. The world keeps turning and you can and should refocus your mind onto things that matter more. Put your time and energy into better things. Sometimes the things you have almost given up on are still options. I know the fight has made you weary and it seems like it’s never going to happen. However, what if you truly gave it ALL again… what could happen. If you did give your all and it did not happen, you would still be here. Life would still be here. Yes it would hurt and it is scary. Is it worth it? Is it so important that it is worth the risk? If so, put away your fear! Put away all of the what ifs. Stop sabotaging steps of your success because you’re actually just afraid of a possible negative outcome!!! Just do it! Try!!! Make the move you’ve been scared to make! Sometimes we see someone going through something caused by their own actions. Or about to make a really bad choice. You’ve been biting your tongue out of respect or the possibilities of them getting mad at or hurt by you. Do you truly care for them? Is their life happiness worth stepping up and speaking the wisdom they truly need to hear? Is their success and safety and happiness important enough to lay yourself on the line and do the right thing? Today… take the blame even if it’s not yours. But be genuine in your desire to simply do whatever it takes to stop the fight. Ask for forgiveness for your side. Be honest. Be humble. Life is too short to allow friendships and other relationships to crumble over pride on either side. Today… Decide to pick yourself up out of your pity party. Find a person even if it’s an audio book person, to help motivate you and uplift your attitude and determination. Choose a course towards a new goal that you’ve been wanting to accomplish and focus your time and energy into this. Every time a negative thought or moment steps in, use it to launch you deeper into an action step towards this goal. Refocus your mind on this. Today… Take 10 minutes to truly think on the things you are about to give up on. Are they hard things that you truly want and need to focus on and fix? Or are they dead ends that you need to walk away from? If the latter, find a friend who will hold you accountable to staying away. If it is important and deep down you desire that, then stop lolly gagging and get off your tush and fight for it again! Find a friend who can help you when you get beat down or tired. Every boxer needs a person in their corner. Look around you, there is always someone. There is always something. Go to God’s word about this. Pray about it. Put your boxing gloves back on… you are not down for the count otherwise you wouldn’t be able to read this! You are still in the fight!! With enough energy, enough fight, you can do it!!! You can win this. Do it! Be brave enough to lose a fight, while still fighting to win the battle! Today… Make the person you care about more important than yourself. If you truly love them, if their success and happiness is worth more than your possible hurt feelings, make the decision to step up and be the true friend you say you are. Say the hard words. Help them! Life is too short!!!!!! Life is too short to have to be right. Life is too short to spend it sad & depressed. Life is too short not to fight for those things you truly want in your life. Life is too short to not help others for the fear of making them upset. Life is too short!!!! 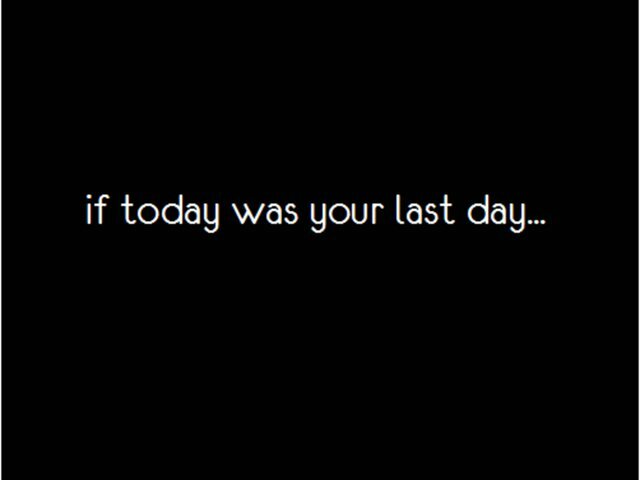 If today was your last day what would you do?